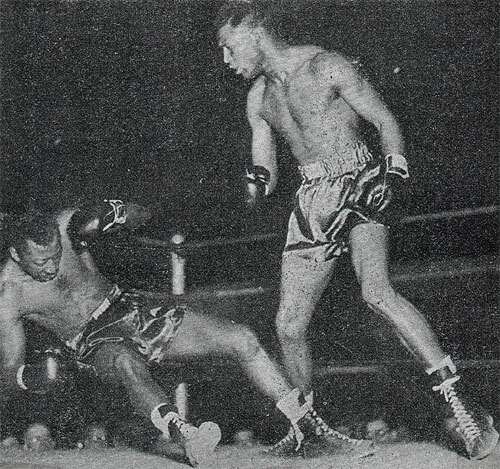 Welterweight champion Ray (Sugar) Robinson dealt George (Sugar) Costner a bitter blow when the titleholder knocked out the Camden slugger in two minutes and ten seconds of a scheduled 10-round non-title fight last night at Convention Hall. It was almost a repetition of their first meeting five years ago in Chicago when Robinson scored an opening round knockout. So spectacular was the ending that 11,747 paying guests, largest local gathering of the indoor season, felt it had ample return for its investment.